9to5mac has some more information and also lists the deals available to you on the iOS App Store – you can check them out here! Yoink – 57% off for a limited time as part of the Mac App Store’s Get Productive promotion! 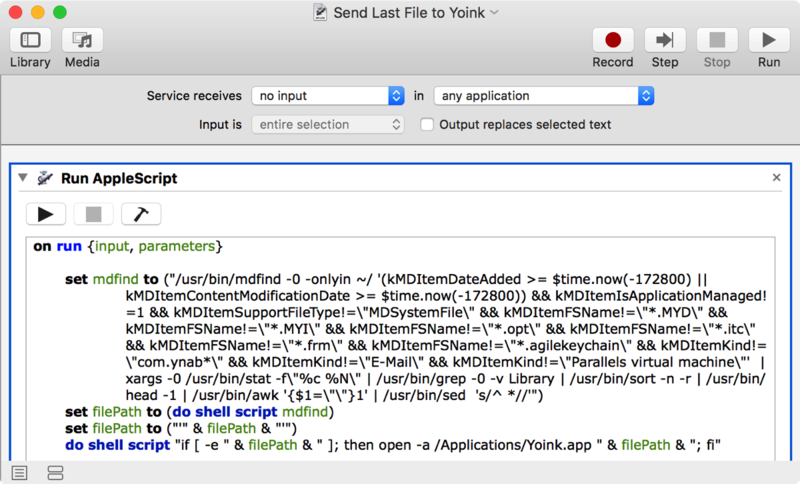 Yoink users have been automating adding various files to Yoink via Automator Workflows for a while now – from adding mail attachments or screenshots, to adding files from the Terminal. Douglas (@douglasjsellers on twitter) today adds to this list of wonderful workflows an Automator Workflow that lets you quickly add files that you created/saved recently. I cooked up my Automator Service that lets you send the last file that you saved (from any application) to Yoink. When bound to a key combination this allows you to do things like “Export to Web” from Adobe Photoshop, hit the key combo and then the newly created png is on Yoink. Or say you’re editing a file in Emacs and you want to add it as an email attachment. You save the file, hit the key combo and the file will then be in Yoink for easy dragging into your email. I also use it heavily to get recently downloaded files from chrome to Yoink. The main part of this workflow consists of a complex shell script that finds files that were recently saved, excluding files that are less likely to be needed in Yoink – obviously, this is something everybody needs to configure for themselves, but since this is an Automator Workflow, it is easily done. The Automator Workflow is available for download here (~130 KB). My thanks to Douglas for his awesome work.